White kitchens never seem to go out of style, but there’s a fine line between white that’s beautiful and white’s that clinical. If you love white and grey, but don’t want your kitchen to resemble a hospital room, try these tips from Dallas’ top interior designers and kitchen planners. Often called the New Chicago, Dallas is coming into its own as an interior design capital thanks to nationally recognized names such as Charlotte Comer, ASID RID. Comer believes a monochromatic color palette works best if the client wants their interiors to stand the test of time, but monochromatic doesn’t mean all the same hue. For this contemporary kitchen, Comer used Decorator’s White and Ozark Shadows by Benjamin Moore (cut by 75%.) palest grey anchored by whispered natural hardwoods to achieve a pristine harmony. 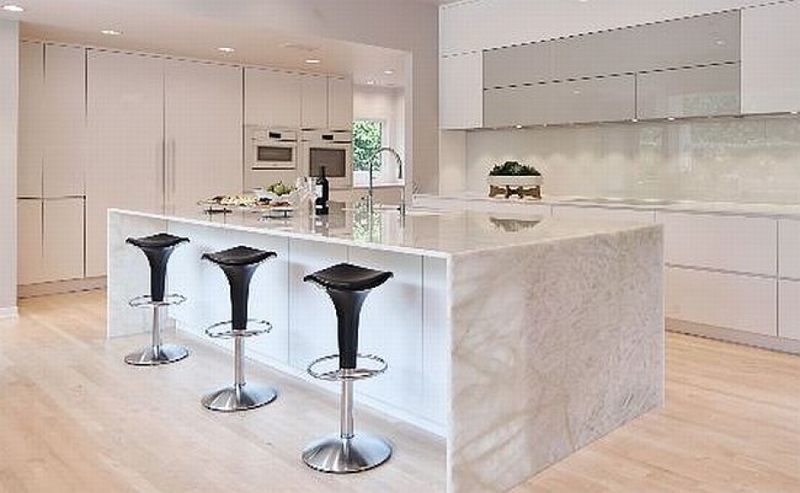 The waterfall island countertop in Bianca Quartzite by Aria Stone Gallery is the only pattern. Terry worked with General Contractor Ronny Henderson on the contemporary kitchen pictured below which features bookmatched Crema Calacutta marble as the main focal point. The colors in the countertop, cabinetry and floors pick up the tranquil veins of sandy beige in the statement piece stone. “You want the whites and greys to appear curated because they are when you factor in everything else besides wall color,” advises Terry. A final way to do white and grey well is by pairing them with a little color, as this transitional Dallas high-rise kitchen demonstrates. Interior Designer Dona Rosene used this beachy palette of whites, driftwood and blue to remind her clients of their East Coast seaside home. She used Benjamin Moore’s Cotton Balls on the ceiling, and used Sherwin Williams’ Creamy on the molding to transition to Benjamin Moore’s Beachglass. The color choices complement the sunny suburban Dallas skyline. Remember what you want from white. Look for colors that are calming, clean as opposed to muddy, and use paint with a matte finish or soft eggshell finish to avoid hot spots and reduce glare.